Also, this won’t be my typical review. This review is just a normal review on the movie I just watched. And, won’t be included in my Every Animation Movie Collection. I will include a real Moana when I get to it, but that won’t be for a really long time. Since, I’m still in the 1950s and this is all the way in 2016. Finally, saw Moana last night and it was difficult avoiding any spoilers about the movie. But, it was worth it. Moana has now gone into my top 10 Disney animated movies. (And, it’s pretty difficult to get in there.) I never thought I would absolutely love another Disney movie again, especially one so recent. Don’t get me wrong, there are newer Disney movies I really liked, Tangled, Big Hero 6, Zootopia, etc. But, I don’t love them. Yet, I love Moana. Moana has some of the most beautiful animation I’ve seen in a long time from Disney. And, there are some scenes that just look so real. The ocean is the best part. It really feels like you are there. The fish, the flowers, everything is absolutely beautiful. 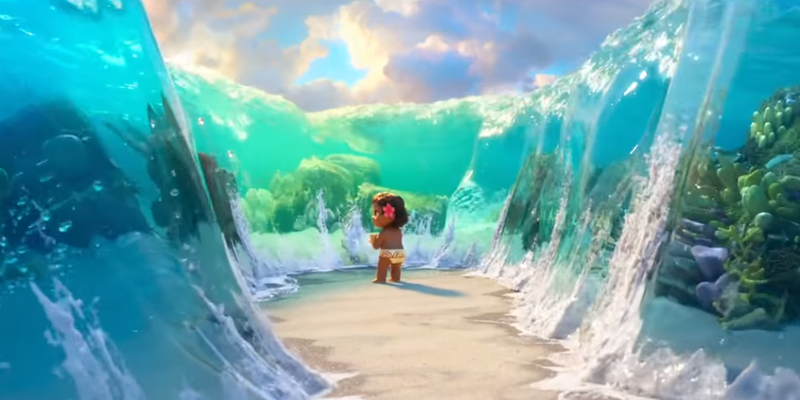 When, Moana whips her hair, it actually looks like real hair. I prefer 2D movies, but I’m really glad they used 3D with this movie. It works so well. The only 2D they used was in Maui’s tattoos, and it was absolutely awesome. His tattoos look so great. Most of the characters are great. I didn’t really like Maui’s character, but in the end, I was able to tolerate him. The crab character, I thought was literally pointless, but he was only there for a few minutes, so I’m okay with that. The other characters are great. But, Moana is amazing. She reminds me so much of a combination of the Disney Princesses. She is innocent like Snow White, kind like Cinderella, beautiful like Aurora, curious like Ariel, smart like Belle, headstrong like Jasmine, adventurous like Pocahontas, brave like Mulan, hard-working like Tiana, spunky like Rapunzel, independent like Merida, and awkward like Anna. (She especially reminds me of a mix of Ariel and Pocahontas) Her character is great. She is officially my new favorite Disney princess. Also, Disney put in a lot of work to stay true to the Polynesian community. And, it showed quite well. It really seemed like you were hearing an actual story from an elder. All the small details and attention were great. The voice acting is great. Au’li awesome, The Rock awesome, the other characters awesome. And, whoever played the crab (which I didn’t like the character) was freaking awesome. It really fit. Au’li was the best choice for Moana. Her voice fit her so perfect. Great casting choices! Also, this movie is very sad. I won’t tell you what happened, but I’m embarrassed to admit, that I cried. I tried really hard not to, but I couldn’t. Why Disney, why? Now, it isn’t as sad as say, Bambi or Dumbo, but it is still sad. Now, we get to the part that I didn’t really like: the music. I am sorry to whoever did the music, but besides like two songs, I didn’t like the music. And, even though I liked those two songs, I felt they could’ve done better. The songs are similar to Frozen, where they are more pop-oriented instead of actual classics. I really wish Disney would go back to that, because that is what they are best at. And, the music is always timeless, but hasn’t been in a few years sadly. 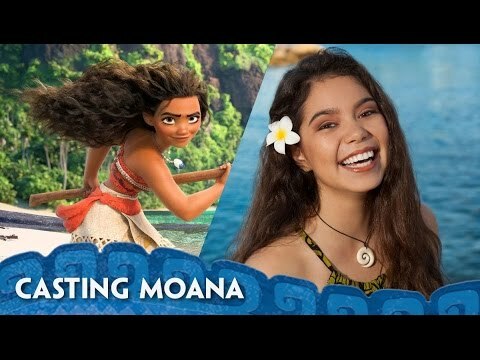 I do think that Au’li (the voice of Moana) has a really pretty voice, especially for a 14 year old. I did like her version of the song. (Also, I’m sorry, I love the Rock, but he can not sing). Now, is this movie as good as The Lion King? No, but I mean The Lion King is perfect. But, this movie is extremely well-done and worth a watch. If you want a movie that is combined with The Little Mermaid, Pocahontas, Mulan, and Lilo and Stitch all rolled in one, and then Moana is the right choice for you! Really interested to hear your thoughts on this! I too really enjoyed it and know what you meant about never thinking I could love another Disney movie! I dunno where it ranks on my favorite Disney movies lists so far, but it’s really amazing! I loved the animation, the culture, the characters, the story, etc. I actually liked Maui and the crab was awesome even though his whole sequence and song were entirely pointless. Now, it took me a while to get into the music; I had to go through the first two songs, but then I got into it and actually did love them! At least better than Frozen! ‘Shiny’ was the catchiest to me, but my fave was ‘We Know the Way’. Which 2 did you like? I didn’t mind the crab, but I just felt that was the weakest link to the movie. And, they could’ve put something more beneficial to the movie rather than that. But, ehh it’s whatever lol. Yeah, the crab was a “Big Lipped Alligator Moment”, if you’re a fan of the Nostalgia Critic to get that reference. The We Know the Way song is the one where they sing in their native language at the beginning. It’s when she’s in the cave and realizes that he ancestors were sea voyagers and then the song sequence starts. lol no i have no idea who that is or what that means for that matter lol. Oh okay then I think that may be the song I like as well, but I’m not sure yet. Lol, yeah a “Big-Lipped Alligator Moment”, according to the Internet reviewer, The Nostalgia Critic, refers to scenes or songs that just pop up out of nowhere, have little or nothing to do with the plot, and then aren’t ever referenced afterwards usually. Really? I LOVED Moana, except for like…two songs and one scene. Remember the scene where she’s eating pork and talking to the cute pig? Yeah, that scene consistently makes me cringe. The Rock definitely can’t sing, but he can carry a tune, so he has my blessing to be a Disney character. Maui’s tattoos might be my favourite thing about the movie…mini Maui was HILARIOUS- such a sass monster! Well, after watching Moana numerous times, I certainly changed my opinion on the songs. I really like the songs. They just took a little while to grow on me. I still haven’t changed my mind about shiny though. That scene could’ve been put to better use. Aww, I like that scene. I thought it was cute. He can sure carry a tune, and I love him as Maui. That little tattoo was great. He was like Maui’s little conscious lol.